As a sales rep, you know how tricky it can be to remember what you have to do next; such as who you have to call, email and meet with. Maybe you are unable to find the piece of paper you noted it down on, or you had it in your scrapbook but left it at home. Perhaps you mentioned it in your Excel spreadsheet but aren't able to easily access the information. Don’t worry. It’s not just you. It’s thousands of sales reps all over the world. That’s why we created no crm.io: to make sure you never miss out on the next action with a lead! 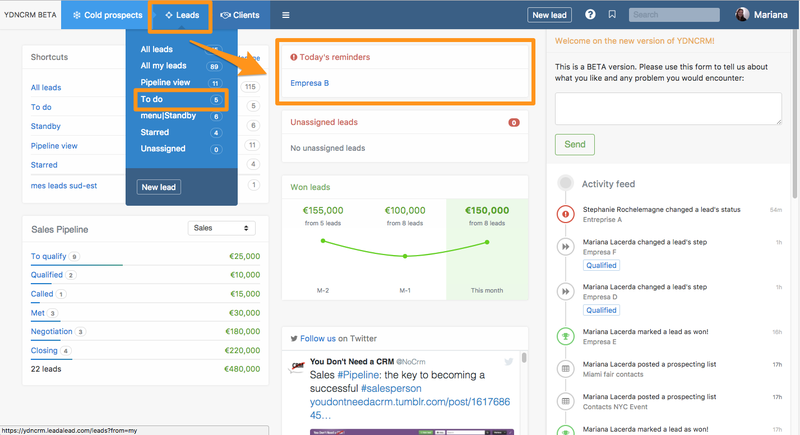 Every morning, when you login to no crm.io, after checking the activity feed for some news, you should go straight to your To-Do page to find all the leads you need to manage that day. You don’t need to waste time looking for the information, or worry that you will lose it. It’s already there, and the system makes sure you don’t miss anything! At the end of the day, if you have worked well the 'To-Do' page should be empty. All leads should have been moved to 'Won', 'Lost' or 'Cancelled' if completed; and 'Standby' if a future action is needed to close the deal. A lead in 'Standby' will automatically move to 'To-Do' at the date you have set. We insist this is one of the biggest strengths of no crm.io because there's always a next action. But, be careful. Creating too many "To-Dos" is not ideal. It's a sign that you are losing control of your leads and that you have neglected certain leads. Once you have over 100 To-Dos, you're in the danger zone. The great thing about this is admins and team leaders can see where there are outstanding tasks and act accordingly. There's plenty of transparency when it comes to this.